Bring Style and Organization to Day-to-Day Operations. Filling out forms for business transactions doesn’t need to be an added chore for your customers. With carbonless forms, you can save time and avoid frustration by making things simple. Victor Printing can print two, three, or four part forms of various sizes. They also offer a large selection of custom value services to meet the needs of your customers. Some of these services include: consecutive numbering and barcoding, glued forms or pads of forms, hole punching, shrink wrapping, Pantone inks, and more! Need help making your business forms have the right layout? Victor Printing has awesome graphic designers sure to make your client’s vision a print-reality. And, they can help with any type of carbonless forms, invoice forms, books or any other print-need. With the variety of form printing options available at Victor Printing, you’re sure to get forms that fit your customer’s needs. Custom design is affordable. Call 800.443.2845 and have your print project quoted today! 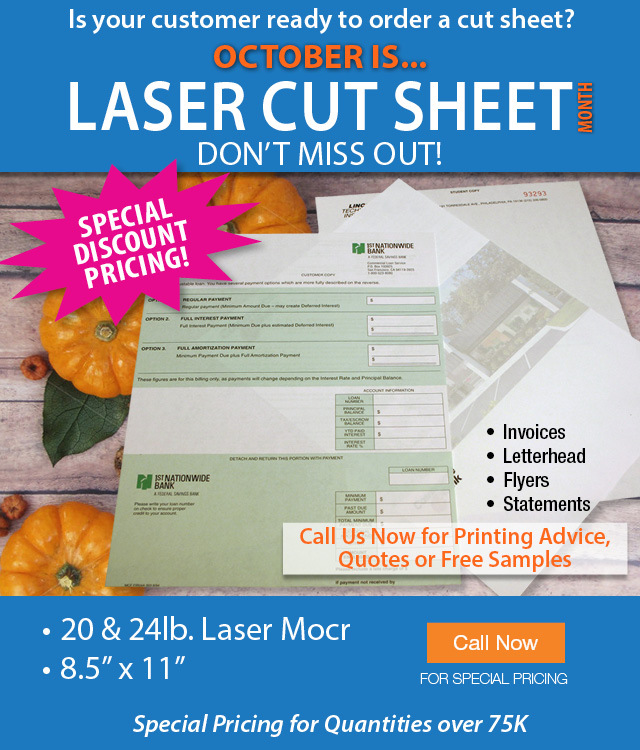 Check October’s special pricing on Laser Cut Sheets -> 800.443.2845 or visit our website. Email us a quote today! « Trade Printers – Are They a Fit for You?